The BIG IoT project focuses on easy integration of the IoT data and services offered by existing IoT platforms and services based on semantic tech- nologies. To enable IoT applications to consume data and services provided by heterogeneous systems and different stakeholders, a common set of ontologies and an RDF triple store with querying functionalities are used in the service discovery phase. The subsequent communication between such applications or services (as consumer) and the provider can be optimized as well. 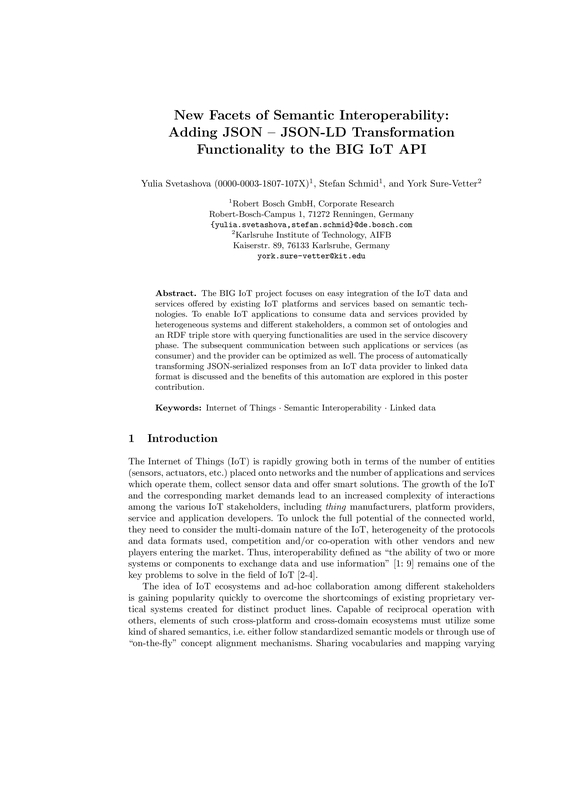 The benefits of transforming JSON-serialized responses from an IoT data provider to linked data format are discussed and the feasibility of automating this process is explored in this poster contribution.